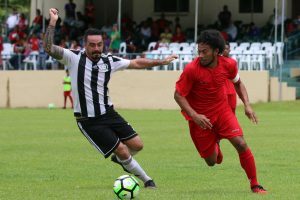 Tupapa Maraerenga have earned three crucial early points after defeating Lupe Ole Soaga 1-0 while Veitongo and Pago Youth had to share after a 1-1 draw on the first day of action at the OFC Champions League 2018 Qualifiers in American Samoa. Although Lupe Ole Soaga threw everything into the milestone match doing well both in defense and up front, Tupapa Maraerenga were the only side able to capitalise. With superior fitness, helped out by the sending off of Lupe’s Vaa Taualai with just over 20 minutes to play, Tupapa started taking control of the game and within five minutes of gaining the man advantage, had their goal. Sean Latimer whacked the ball off the upright from the penalty spot to take the lead which they would hold onto for the remainder of the match. Tupapa Maraerenga coach Alex Napa was very pleased to begin the 2018 campaign with a win. “I think both team played extremely well, and tried to make the most of their chances, we got lucky and sometimes we need luck to be able to do this,” Napa said. Napa also spoke highly of his team’s performance. “I think my team performed relatively well. I mean, there is room for improvement, and playing against another team give us that opportunity to take a closer look at ourselves under pressure,” he added. Lup Ole Soaga coach Paul Ualesi was hugely disappointed to fall at the first hurdle but also knows his side has the character to come back strong. “We lost, but we need to improve some areas. If we want to qualify we need to improve,” he said. 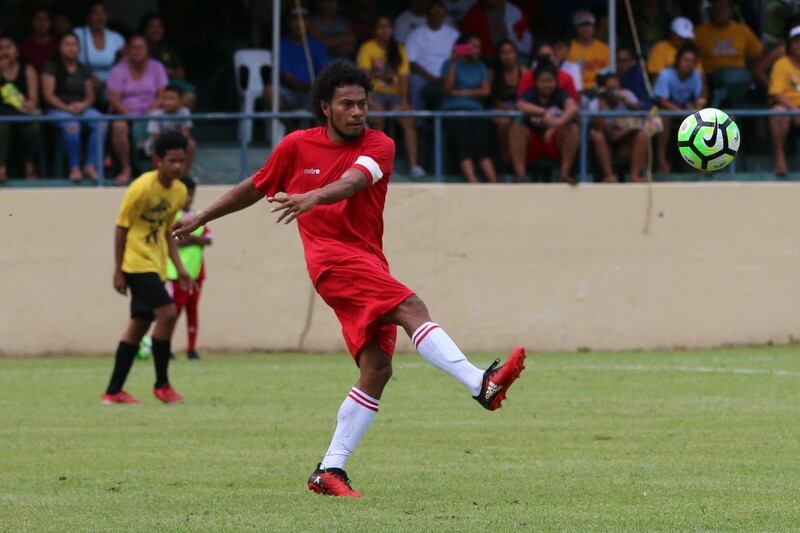 The second game at Pago Park Soccer Stadium had Tonga’s Veitongo FC taking on the home side of Pago Youth. Historically both clubs have struggled at regional level so it came as little surprise today’s encounter was a close one between two evenly matched teams. Veitongo had fans watching at home thinking they’d gone a goal up in the 14th minute when Tongan youth international Soakai Vea netted from a free kick. However referee Veer Singh had other ideas, ruling the goal out to keep the teams locked at 0-0. That all changed when Nissan Silao took an audacious punt from inside his own half and, assisted by some average goalkeeping from Motekiai Faupula, put Pago Youth in the lead. 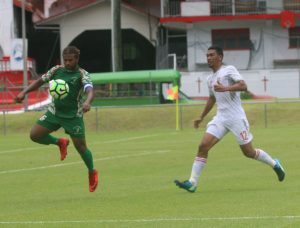 It was a furious match as Veitongo looked for an equalizer while Pago continued pressing in an effort to extend their lead, however the home side’s luck ran out when substitute Ruben Luvu Jnr. was given his marching orders for a second caution. Although Veitongo were a man up, at times it seemed like perhaps it was Pago with the advantage as they made several daring breaks on the counter. But with only additional time on the clock Veitongo captain Sione Uhatahi found the back of the net allowing his side to pull even for a share of the points. Veitongo coach Timote Moleni had been confident ahead of the match and at the final whistle wasn’t entirely pleased with the performance from his side believing the game had been theirs to win. “My team made a lot of mistakes and we really need to work hard on our finishing. We had so many chances to score a goal, but we failed to finish,” Moleni said. 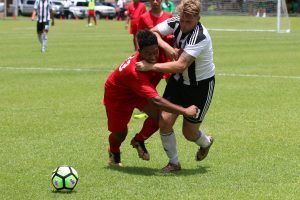 For Pago coach Li’atama Amisone Jnr although there were areas his side could improve, overall he was pleased to take a point home. “We couldn’t get out finishing right but I think we did well with only ten players,” he said. The OFC Champions League 2018 Qualifier continues on Tuesday 23 January [ASA Time] when Veitongo take on table leaders Tupapa Maraerenga before Pago Youth look to continue gathering points against Lupe Ole Soaga.